Wangari Maathai is perhaps best known for creating the Green Belt Movement of Kenya, a program recognized all over the world for combining community development and reforestation to combat environmental and poverty issues. Maathai excelled at mobilizing people for a very simple goal - reforestation - which also impacted poverty and community development in Kenya. Maathai believed that people needed to help with environmental issues and should not rely upon the government. Maathai clashed with the Kenyan government, often at risk to her own life, when she opposed destructive governmental initiatives. 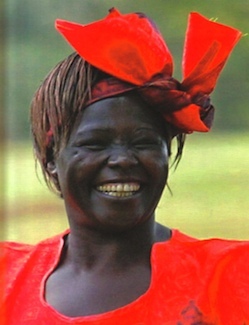 In 2004 Wangari was the first environmental Activist to win the Nobel Peace Prize!